Godzilla and Mothra are, IMHO, the best dynamic duo pair of the kaiju eiga (Japanese giant monster) movies. I hope Godzilla, as just about everyone’s top movie monster of all time, needs no introduction. 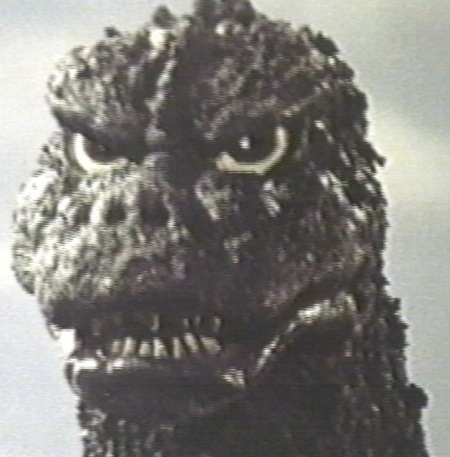 He first appeared in Gojira in 1954, which was recut, and had some scenes added with Raymond Burr to make the (modified) story accessible to American audiences in Godzilla, King of the Monsters (1956). A new Godzilla movie comes every few years in Japan, and he returns just in time for the 60th anniversary of the franchise in a new American blockbuster next year. There are about 30 Godzilla movies to date. Emi & Yumi Ito as the Shobijin in Godzilla vs. The Thing (1964). You can watch Mothra in seventeen films since then, not all of which feature Godzilla. Her most recent outing was Godzilla: Final Wars in 2004, the franchise’s 50th anniversary film. The thing about Mothra that makes her unique in the kaiju menagerie are these freaky-deaky priestess-fairies that are never far from the giant moth. These Shobijin (“small beauties”) are maybe 6 inches tall for no particular reason, and have that odd and unnerving need to sing and speak in unison. 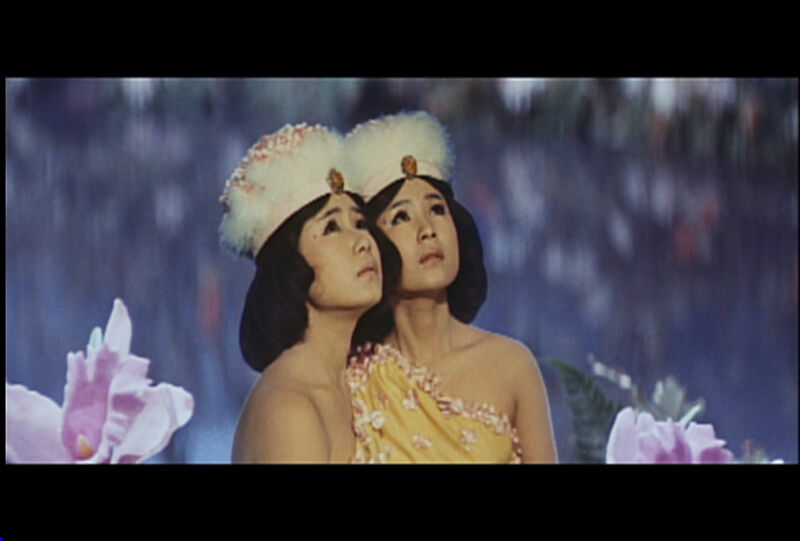 They are Mothra’s only way to communicate directly to the human world–the shobijin are telepathically linked to the beast on behalf of a previously undiscovered, but thoroughly irradiated civilization, apparently living on a Polynesian island close enough to the old US and French nuclear test range. Back to what the interplay and relationship between this dynamic duo brings to the overall story–and I should mention before going too much further that the occasion to think about this is the “Dynamic Duo” blogathon hosted by the Classic Movie Hub and Once Upon a Screen blogs–I see the introduction of Mothra into the emerging Godzilla franchise as sort of a transitional phase for Godzilla–Mothra is the character overseeing the movement of the franchise becoming more marketed to kids, which was in process by 1965, and reached its full flower in 1969’s All Monsters Attack (also known as Godzilla’s Revenge) about a kid finding the confidence in himself to stand up to local bullies by imagining how make-believe in the Godzilla world in which Godzilla’s (talking) son Minilla has the same sorts of troubles with Gabara. Needless to say the franchise’s intended audience has changed over the years, and it soon returned to making movies targeted at adults. Mothra’s origins–on screen, and the resonances of Japanese culture she carries–are another unique feature that give her a special relationship to Godzilla among the the other kaiju. Mothra’s modus vivendi with humanity is rooted in ancient Japanese fables with the shobijin playing the role of keeping lines of communication open between the human world and the monster world. This gives the much more recently nuclear-created Godzilla, depending on which origin story you go with, a certain connection to the mystical realm, which I’m sure the fanfic community is all over, but this connection fades in light of so many non-mystical kaiju creations and the mundane political purposes the kaiju are put to. For instance, in Invasion of the Astro-Monster (or, Godzilla vs. Monster Zero) from 1970, Godzilla, Rodan, and Ghidrah all fall victim to mind control of aliens seeking to take control over the Earth. This is a fun political yarn illustrated by great monsters, but not one with the mystical overtones that Mothra’s sensibility brings to the table. I’ll finish with a couple illustrations of how the broader culture has apparently internalized the Godzilla-Mothra relationship, both in the realm of politics, interestingly. Exhibit A: a short news article in the Talking Points Memo editor’s blog a couple years back in which the Fox News Channel was interviewing some dingbat Islamist staging protests in favor of bringing “sharia law” to the US, a marginal issue, that Fox predictably glommed onto. This was framed on TPM through the lens of the Godzilla-Mothra relationship as “two cartoonish clowns [Fox News and the Islamist protester] doing battle and the only problem is you don’t know who to root for because they’re both so ridiculous.” The author also implied that enjoying these films showed “unrefined tastes,” which I might take some exception to (ahem). Exhibit B is the minor meme that came with last year’s presidential campaign here in the US. 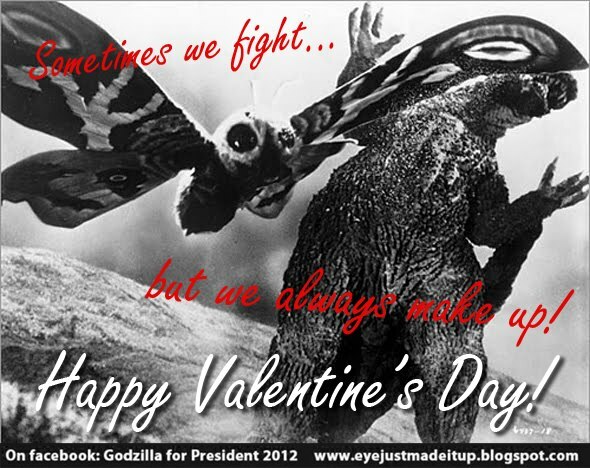 The Godzilla-Mothra presidential ticket strikes a fun nerve–and party activists are currently prepping for 2016, according to their Facebook page, but note we didn’t see Godzilla paired with any other potential kaiju running mate, though a Godzilla-Ghidrah ticket would have me collecting signatures on my block. Posted in 1954, 1956, 1964, 1965, 1969, 1970, 2004, Blogathon EntryTagged All Monsters Attack (1969), Classic Movie Hub, Ghidrah the Three-Headed Monster (1965), Godzilla, Godzilla King of the Monsters (1956), Godzilla vs. The Thing (1964), Godzilla: Final Wars (2004), Gojira (1954), Invasion of the Astro-Monster (1970), Kaiju films, Mothra, Once Upon a Screen, Raymond Burr, Rodan (1956), ShobijinBookmark the permalink. Ha! I love that last banner….did Mothra really star in 17 films? Gosh, I must of only seen three with the giant flapper. How clever the studios were to team Godzilla, king of the monsters, with the flying fortress! Thanks for leading me deeper into the world of Mothra and Godzilla. 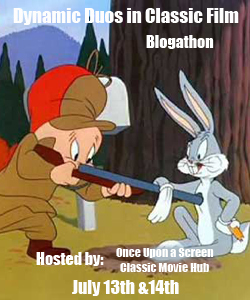 What a fantastic idea for the blogathon!! Also, I loved that you called them `frenemies`. 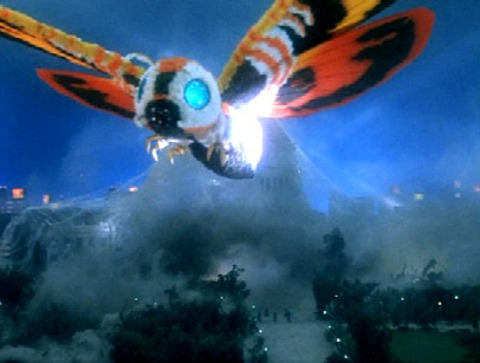 I`ve never seen a Mothra movie. I think I`ll get right on that. Thanks! This was a fun post to write, hope to do more on these monsters soon. When I signed up to do the blogathon myself and saw that you had picked Mothra and Godzilla, I was jealous that I had not thought of it first. However, there was no chance that I could have captured their relationship, nor the history of both iconic kaiju figures in the ways you managed. This is and exceptional piece and makes me want to watch even more the the Godzilla franchise, for which I am already a huge fan. Thank you very much, you are too kind! I didn’t even get to include, because it didn’t have anything to do with Mothra, how “Godzilla vs. Mecha-Godzilla” (1974) seems to have been the inspiration for the Beastie Boys’ 1998 “Intergalactic” video. Right down to the villain’s mustache. I’ve never seen a film with Mothra, and just saw the first Godzilla a few weeks ago — but I enjoyed your write-up and your unique selection of these two “frenemies”! Terrific post! I enjoyed reading your insightful observations about these two kaiju icons, and their respective roles in the transition of the Godzilla movies to kids’ matinee fare. It would be interesting to compare and contrast the 60s Godzilla/Mothra flicks to the 90s versions. Sounds like a great follow-on post! Soon as I’m done with another blogathon and get the rest of the “I Drink Your Blood” cast profiles done. Or sooner, maybe. I already had a lot of love for Godzilla but are still yet to see a Mothra film. Now thanks to your post, I may go out and do just that, if only to see its freaky shobijin companions! Sorry this posted late, your comment got entangled in the spam folder, and I missed it. Ahh! Thank you for talking about my beloved Mothra. Ghidrah the Three-Headed Monster is my favorite Godzilla movie and Mothra’s presence is no small part of it. Thanks for the background, the details and the fabulous images! Pingback: Nerdometrics | How feasible is rebuilding Japan after Godzilla attacks?